I seem to have headed down a sewing rabbit hole the past few months. It's strangely addictive. You'd think that making a few garments badly would put one off, but it has made me all the more determined to make a few successful things to show for all the effort. Actually my persistence is probably more to do with all the sewing blogs I read, and seeing the amazing things that other people create. Anyway - I've been shy about taking photos of myself and posting them on here, which is why most of what I'm making doesn't make it onto the blog. That's my excuse for such infrequent posts! And I'm sticking to it. For the moment. Actually, although I've been sewing since I was very young, I have really only picked it up regularly in the last couple of years. In the past most of my creative energy has gone into other things... bookbinding, drawing, painting, printmaking, jewellery making, etc. I've been getting the urge to get back into some creative things other than sewing. Mark making of some kind. 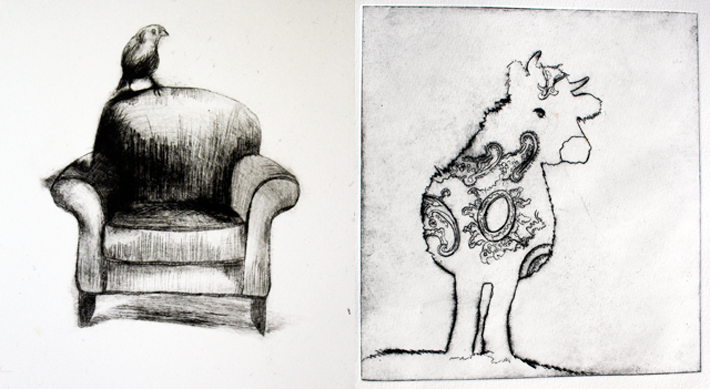 So I have been pulling out a few old etchings, hoping to get inspired to do some more. I love etching, the quality of the mark that you can get by drawing into plastic with a needle (as in drypoint) or the irregular marks that are made by acid biting into the plate. And the ink getting pulled into the paper. There's the apprehension when you pull back the paper after it has gone through the press, and seeing what emerges. It frustratingly hit and miss. And addictive.